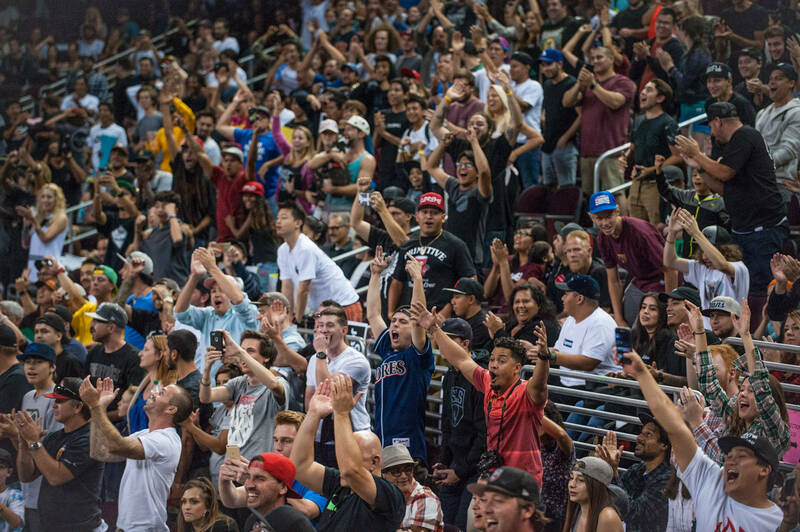 A packed arena greeted the sixteen Street League Super Crown finalists tonight at USC’s Galen Center. Normally, this would be where the Trojans play. But not tonight: the parquet floor was covered with another California Skateparks masterpiece and the seats were filled with total skate nerds ready to savor every delicious trick. The Super Crown course was a tightly-designed affair, perfectly suited for someone with 45 seconds to kill. A little lower and less spread out than this year’s previous designs, the Super Crown design’s layout lent itself very well to choreographed tech skating. Fortune favored the technical: Shane O’Neill took the Men’s honors and Lacey Baker was on top for the women’s. Lacey Baker put together impressive runs. Some people are consistent and some have a mesmerizing style, very few have an above average combination of the two. The way she stomps her tricks and the swervy swagger she has when riding away is almost spiritual to watch. When the cameras focus on her, the look on her face is almost unbearably intense. It’s as if the act of throwing her board down and trying that first trick was the most important thing in the world. Her runs were essentially faultless and each of the five Best Trick attempts were absolute perfection. She won. The women’s contest also featured Aori Nishimura (filling in as alternate; Vanessa Torres is sidelined with a fully torn ACL), Monica Torres, Alexis Sablone, Mariah Duran, Alana Smith, Pamela Rosa, and Leticia Bufoni. Last year’s Super Crown was the first to feature a Women’s contest, and this year, Leticia returned as the defending champ. Leticia’s runs seemed a little subdued, but her approach to the Best Trick section was energetic and inspired. She really knows how to work the crowd—ollieing the big kicker to flat; 180 ollieing to flat—but then out of nowhere she goes for a gap to frontside lipslide from the big kicker. This was a move she landed in practice, but tonight’s audience in the arena hadn’t seen it yet. It was so sudden: here comes Leticia, flying diagonally from the farthest corner of the deck, aiming towards the opposite corner. Two or three robust pushes was all she had time to muster; there was barely any time to even set up for her lipslide. She overshoots her mark and her board clips the edge of the rail. She hit the floor and the crowd gasped. It was unclear whether she smacked her face or just took a violent body blow—as I remember it, the guy selling cotton candy was in my field of vision so I just looked up to the Jumbotron. There’s Leticia scrambling to get back up, but she lays back down. The announcer says, “We have some of the best medical staff on hand here,” and the cameras point towards Leticia’s competitors on the deck. Lacey is visibly upset. After several minutes, Leticia is carried out by EMTs, strapped to a stretcher, with her arm triumphantly extended upward. The crowd loses their minds, screaming and cheering like their lives depended on it. I looked around me—people were delirious, faces were flushed, veins were popping out of necks. Everyone swooned from anticipation. Leticia stole the show. After Lacey’s winner ceremony, it was time for the men to practice for about an hour. Everyone was surprisingly loose—boards were flying out everywhere, Decenzo was saying “excuse me, sorry” a lot—and the atmosphere was very relaxed. The highlights were definitely everything that had to do with Paul Rodriguez: back-to-back tricks on the rail with Shane (Paul’s nollie crook nollie heel out, Shane’s bigspin back tail bigspin out); a gorgeous switch flip back tail shove on the rail. 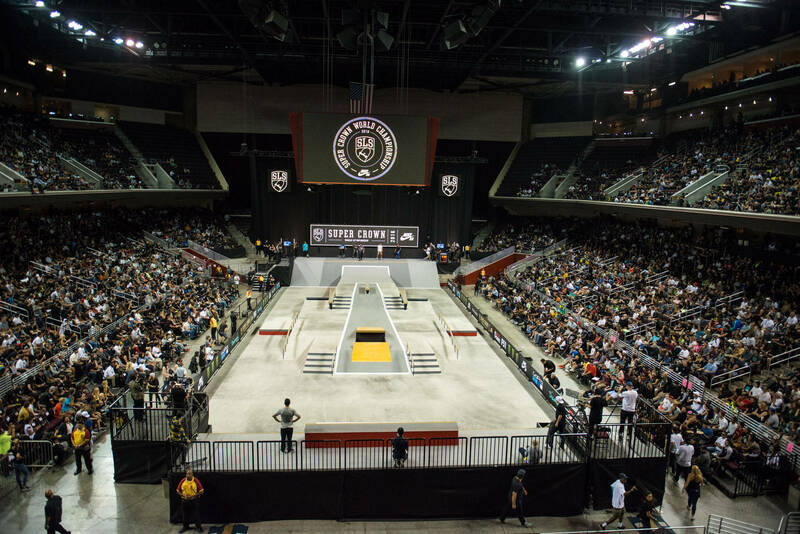 Street League is the only real arena-style contest series in skateboarding. The well-rehearsed theatrics of arena sports apply: over-the-top digital displays, t-shirt cannons, and seachlights weaving all over the darkened capacity stadium. “Let’s me hear you make some noise!” Yep. 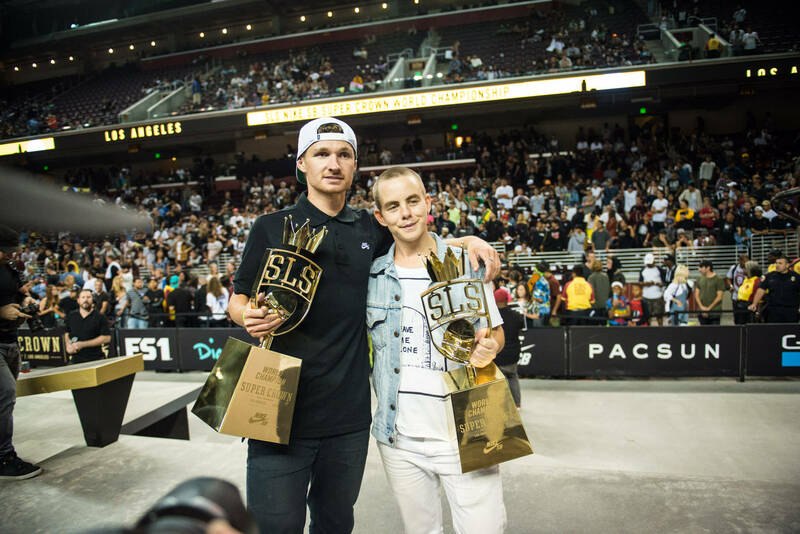 This is Street League, and it’s working. The Men’s contest kicked off with Chris Joslin, and he set the tone immediately with a breathtaking 9.0 run. This course wasn’t big enough for him. His Saturday practice footage made it clear that he could conceivably pull a Kareem Campbell and backside 180 out of the course and into the lower level seats. It wouldn’t surprise me. Joslin is like a shark, he has to keep moving; he must have completely circled the course a total of six times in his first run, which ended with a befuddling gap to backside lipslide off of the big kicker. His second run included a huge backside 360 the big kicker gap to flat and then he ollied the quarterpipe channel, which is easily a car’s-length, or the width of an alleyway, take your pick. The order of the men’s runs was planned to perfection: Joslin, Cody Mac, Ryan Decenzo, Tom Asta. Asta dropped in switch and proceeded to do everything switch or nollie, bailing only on a regular trick. 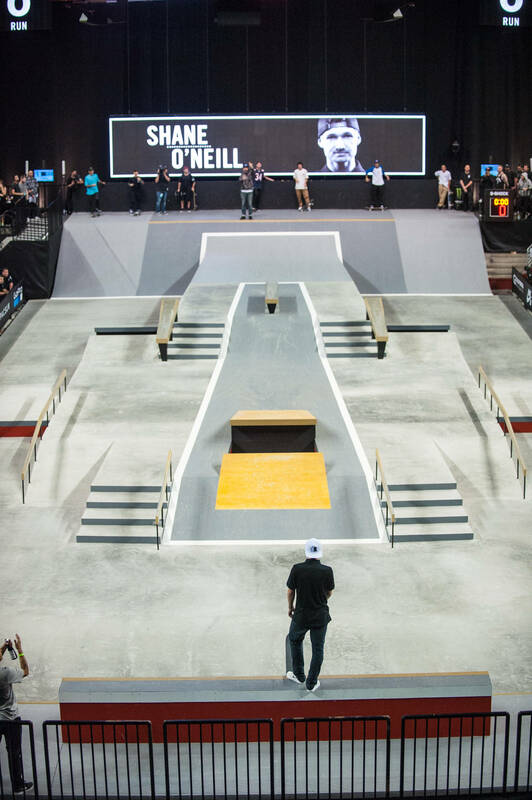 …Luan Oliveira, Shane O’Neill, Nyjah Huston, Paul Rodriguez. By the time you get to P-Rod’s run, it’s practiced perfection. Everything was timed right down to the millisecond, but he took it a little too easy. He scored 8.0 on his first run. Shane started each of his runs with a matter-of-fact, comfortable style. He was a beast in practice, and he still found time to goof off with P-Rod. More than anyone else—even Nyjah—Shane made the smaller, tighter course work for him. He adjusted his pace, fine-tuned his choice of tricks, and developed an approach that was just right for this layout. Everyone knows that Shane is a visionary, progressive skater who can do so many ledge/manual/flip combos your head would spin. But he almost dialed it back a little bit for the Super Crown, and his restraint put him over the edge. With the absence of a Big Section, this course was much lower in terms of drops. If there are no drops, then you look for big gaps to get that wow factor. Shane instead decided to do tricks that look good and focused on getting hs score on the board. The result was a bunch of 9 Club scores for Shane (switch 360 flip lip, switch big flip front board, and a nollie 360 flip lipslide for 9.4). Joslin, on the other hand was doing something completely different. Four of his five Best Trick attempts were tricks that he didn’t even do in his run (most of his competitors were going for tricks they’ve already nailed in runs). One of them was an ollie to fakie acriss the channel. He landed it for his fourth Best Trick attempt. On the fifth and final attempt, Joslin had a chance to nab first place. He only needed an 8.5. What a story that would’ve been, right? 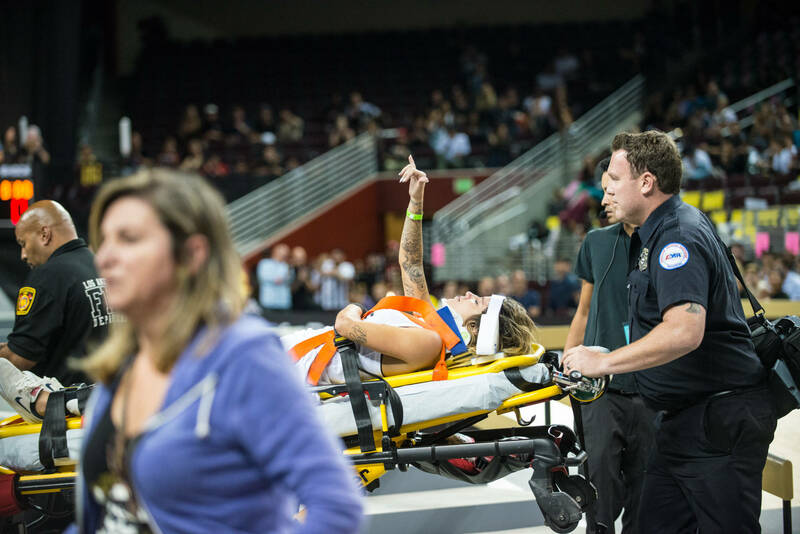 Chris Joslin, skateboarding’s Cheshire Cat, winning his first-ever Street League Super Crown. He went for a frontside flip over the gap-to-rail. He bailed, and Shane shook his head in disbelief. The roar in the stadium when Shane won was the sum of all of the previous night’s roars, multiplied by 100. Shane was the People’s Champ and he can do no wrong. People in the nosebleeds were throwing trash and paper planes, crumpled cans, and even tortilla chips in celebration. By the time full bottles of water were being tossed from the upper decks, people had started filing out. On the Jumbotron, Shane was being interviewed. The usual questions: “How does it feel?” etc. As Shane tried to find the right words, a paper plane whizzed past his head. The latest edition in the GoPro Hero line is available today and it is a waterproof, voice-controlled thing of beauty.